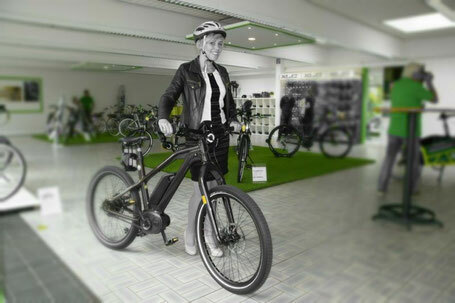 Immer mehr Pendler steigen auf das e-Bike um, denn sie sparen Zeit, Geld und tun etwas für die Gesundheit. Das Auto wird immer öfters stehen gelassen, denn wer fährt nicht gerne mit 10 cent Strom ganze 100 km weit. Durch das sogenannte JobRad oder Firmenrad Modell kann jede Firma seinen Mitarbeiter ein e-Bike leasen und per Überlassungsvertrag zur Verfügung stellen. Die Leasingrate wird einfach vom Lohn abgezogen und der geldwerte Vorteil wird über die 1% Regelung, welche auch vom Firmenwagen bekannt ist, versteuert. My spouse and I absolutely love your blog and find nearly all of your post's to be what precisely I'm looking for. can you offer guest writers to write content available for you? I wouldn't mind composing a post or elaborating on many of the subjects you write regarding here. Again, awesome site! I visit everyday some web pages and sites to read articles, except this web site presents quality based writing. I do not even know how I finished up here, however I assumed this submit was once good. I do not recognize who you are but definitely you are going to a famous blogger if you are not already. Cheers! Just wish to say your article is as astonishing. The clearness for your put up is just cool and that i could think you are knowledgeable in this subject. Fine along with your permission allow me to clutch your RSS feed to stay up to date with approaching post. Thanks a million and please keep up the enjoyable work. fantastic post, very informative. I'm wondering why the other specialists of this sector do not realize this. You must continue your writing. I am sure, you've a great readers' base already! Hey there excellent website! Does running a blog similar to this require a great deal of work? I have very little knowledge of computer programming but I had been hoping to start my own blog soon. Anyway, should you have any suggestions or techniques for new blog owners please share. I understand this is off topic but I just needed to ask. Kudos! Attractive component to content. I simply stumbled upon your web site and in accession capital to assert that I get in fact enjoyed account your blog posts. Any way I'll be subscribing to your augment and even I fulfillment you get admission to persistently rapidly. What's up it's me, I am also visiting this site on a regular basis, this site is genuinely good and the viewers are genuinely sharing fastidious thoughts. I am really loving the theme/design of your site. Do you ever run into any web browser compatibility issues? A handful of my blog readers have complained about my blog not working correctly in Explorer but looks great in Firefox. Do you have any ideas to help fix this problem? An impressive share! I have just forwarded this onto a co-worker who had been doing a little homework on this. And he in fact bought me lunch due to the fact that I discovered it for him... lol. So let me reword this.... Thanks for the meal!! But yeah, thanx for spending the time to talk about this issue here on your blog.